When Boston Globe Media unveiled Stat a year ago, it struck many observers—including me—as wildly ambitious. With more than 50 employees, it was hard to imagine how the health and life-sciences site was going to make money. Gideon Gil, the co-managing editor, told me that Stat would probably start charging for some of its content, but at the time there was no plan beyond gathering data to see how that might work. Now we’re seeing the next phase. Stat editor Rick Berke, in a letter posted online, has announced a redesign and, far more important, a premium service called Stat Plus, which will cost about $300 a year. According to Lucia Moses of Digiday, the target audience comprises “professionals working in and around the pharma and biotech industries.” The goal is to sign up 10,000 subscribers. My first thought is: Why so little? As Moses points out, the model for this sort of thing is Politico, whose pro edition starts at $5,000 a year. Individuals aren’t likely to pay for Stat Plus; rather, it’s a business expense. On the other hand, it might make more sense to start at $300 and then add, say, an ultra-premium service later on (Stat Plus Plus?) than to start high and have to cut the price. The purpose of Stat is two-fold: to offer high-quality journalism in a field in which Boston is a leader, and to make money that can help fund not just Stat but the Boston Globe itself. Stat‘s first year showed that it could accomplish the former. Today’s announcement is an important step toward meeting the second goal. Washington Post executive editor Marty Baron (left) interviews Post owner Jeff Bezos at a recent event. Donald Trump’s decision to revoke The Washington Post’s press credentials is nothing less than a repudiation of the role of a free and independent press. When coverage doesn’t correspond to what the candidate wants it to be, then a news organization is banished. The Post will continue to cover Donald Trump as it has all along — honorably, honestly, accurately, energetically, and unflinchingly. We’re proud of our coverage, and we’re going to keep at it. It was just a few weeks ago that Trump launched a Nixonesque attack on the Post and its owner, Amazon chief executive Jeff Bezos. • Shouldn’t we be suspicious of any news organization that hasn’t had its credentials revoked by the Trump campaign? • This won’t hurt the Post a bit. Access is hugely overrated. • I’m sorry that this is the first time I’ve written about Trump’s banishment of journalists. Previously he’s gone after Politico, the Huffington Post, and the Daily Beast. Yes, the Washington Post is one of our great newspapers. But Trump’s attacks on other news organizations are no less despicable. • I’d like to see every news organization covering Trump burn their credentials and refuse to report on his events until open access is guaranteed for all. I want to call your attention to two terrific pieces about Trump University—both published by Politico, both by people I know. As you are no doubt aware, Trump University, a dubious venture that dispensed real-estate tips and that is under investigation by the New York attorney general’s office, has become a major issue in Trump’s presidential campaign. I’d read Trump’s The Art of the Deal in college, so when I spotted an internet ad for the Trump “way to wealth” seminar, I thought it might be an interesting vantage point from which to capture the feelings of regular people at a terrible time. I was also intrigued by the idea of what strategies a figure as rich and famous as Trump could bring to the public, in the midst of a crisis to which few had any solutions. The second piece is by Marilyn Thompson, an editor at Politico who’s currently a Joan Shorenstein Fellow at Harvard’s Kennedy School, as am I. Marilyn reports on an online advice column for students of Trump U that was published under his name. “How much of ‘Ask Mr. Trump’ was written by Trump himself is, of course, open to further examination,” she writes. Marilyn proceeds to recount what Trump told a 13-year-old boy (“Sounds like you’re a hard-working young person!”), what drives him (“I don’t have to work, I don’t have to make deals, but it’s what I enjoy”), and how he coped with the stress of being $1 billion in debt (“I started describing to everyone all of my plans for future projects and developments, and how fantastic they were going to be”). These days, no doubt, he relieves the stress by telling his campaign officials how great that wall is going to be once he’s been elected president. Illustration (cc) by Mike Licht. Ben Carson in Nashua, New Hampshire, in July. Photo (cc) by Marc Nozell. The doubts raised by Ben Carson and his defenders are beginning to recede. Politico’s story that the Republican presidential candidate had “fabricated” his oft-told tale about being offered a “free scholarship” to West Point is looking reasonably strong, though not perfect. In an editor’s note that now appears at the top of the story, Politico says it stands behind staff writer Kyle Cheney’s reporting while conceding that the Carson campaign had not admitted to any falsehoods. Media blogger Erik Wemple of The Washington Post has a good rundown. We still don’t know exactly what happened. My theory is that Politico’s editors took a solid story and got themselves into trouble by cranking the volume up to 11. But even though Carson is not admitting to anything (see this New York Times account of the uncharacteristically belligerent news conference over which he presided on Friday), the evidence is piling up that he is, in fact, a serial fabricator. In his 1990 autobiography, “Gifted Hands,” Mr. Carson writes of a Yale psychology professor who told Mr. Carson, then a junior, and the other students in the class—identified by Mr. Carson as Perceptions 301 — that their final exam papers had “inadvertently burned,” requiring all 150 students to retake it. The new exam, Mr. Carson recalled in the book, was much tougher. All the students but Mr. Carson walked out. When the dust settles, I suspect that Politico’s tactical retreat is not going to look like a very big deal. We are left with a frontrunner for the Republican presidential nomination who appears to have concocted multiple elements of his life story and who has made bizarre or offensive (or both) statements about Muslims and the presidency, Jewish victims of the Holocaust and (yes) the pyramids. The next Republican debate is Tuesday night. It will be interesting to see if Carson is willing to show up and face the music not just from those nasty moderators but from his fellow candidates as well. *You do know how to access Wall Street Journal articles if you’re a non-subscriber, right? Just search for a phrase from the article in Google, click and you’ve got the whole thing. It’s OK — Rupert knows about it. 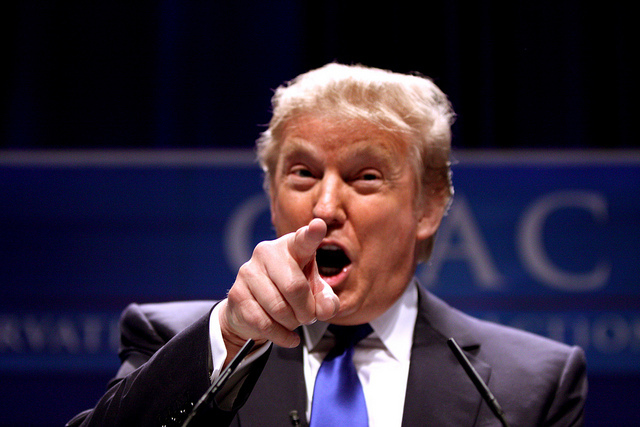 Will the media call out Trump on his anti-vaxxer nonsense? Donald Trump in 2011. Photo (cc) by Gage Skidmore. Some rights reserved. By any reasonable standard of what constitutes acceptable public discourse, Donald Trump’s presidential campaign should have ended on Wednesday at about 10:50 p.m.
That’s when he set his extravagantly sprayed hair on fire by indulging in some truly dangerous myths about vaccines. It was, by any measure, a deeply irresponsible exercise. I’d call it pandering, except that it’s possible he believes his own foolishness. It began when CNN debate moderator Jake Tapper invited candidate Ben Carson, a physician, to lambaste Trump for repeating the false claims of the anti-vaxxer movement linking vaccines to autism. Carson responded mildly — too mildly. And that gave Trump an opportunity to pounce. Sadly, neither Carson nor the other physician-candidate, Rand Paul, wanted to rile the conspiracy theorists they’re hoping to win over. So both men oh-so-respectfully disagreed with Trump while actually endorsing his statement that parents ought to be able to spread out the timetable for their children to get vaccinated. Vaccines are very precisely manufactured to include only what is absolutely necessary to induce enough of an immune response that the body can protect itself against those diseases. So a smaller dose wouldn’t protect a child. It would stick a child with a needle for no reason at all. And spreading out vaccines? That just increases the risks to the children, including leaving them more susceptible to the diseases for a longer period of time. So what was CNN’s responsibility in promoting Trump’s life-threatening views? Some, such as Dartmouth College political scientist Brendan Nyhan, took to Twitter to argue that Tapper shouldn’t have asked the question in the first place. I disagree. If, God help us, Trump actually got elected president, he’s going to be besieged by anti-vaxxers demanding that he translate his rhetoric into policy. Then, too, Michele Bachmann in 2011 and Chris Christie earlier this year did enormous damage to themselves by embracing the anti-vaccine movement. Why should it be any different this time? Still, Wednesday night felt like a botched opportunity to educate viewers about the importance of vaccines. Media reaction to Wednesday night’s anti-vaxxer moment was slow out of the gate, but by later Thursday and on Friday it had picked up. A particularly intriguing tidbit comes from Stat, a life-sciences vertical that’s part of The Boston Globe. According to reporters Eric Boodman and Ike Swetlitz, Trump is both a donor to and supporter of Autism Speaks, which emphatically rejects the anti-vaxxer myth. In the immediate aftermath of the debate, the most addled take was offered by The Weekly Standard’s Fred Barnes (God love him), who wrote that Trump “surprised everyone, including Dr. Ben Carson, by being well-informed on the use of vaccines. As usual, he was a powerful presence.” You can’t make this stuff up. For months, Carson has touted his medical expertise while on the campaign trail. And in the weeks since the first debate, the famed surgeon has risen in the polls as a milder-mannered, more rational alternative to Trump. Now was his chance for a home run; a big hit as swift and incisive as any surgical operation. We’ll see. Some 51 percent of respondents to a survey posted at the Drudge Report thought Trump won; Fiorina came in second with just 19 percent. It was totally unscientific, of course, but more than 680,000 people took the time to register their views. Overall it was a dispiriting night. It was somehow appropriate that it ended with the news that right-wing hatemonger Ann Coulter was ranting on Twitter about the “f—ing Jews.” I mean, really. What else? The vaccine issue, though, deserves to linger — and fester, and grow, until all but Trump’s most unhinged supporters understand that this man has no business being anywhere near the White House. Published previously at WGBHNews.org and The Huffington Post. 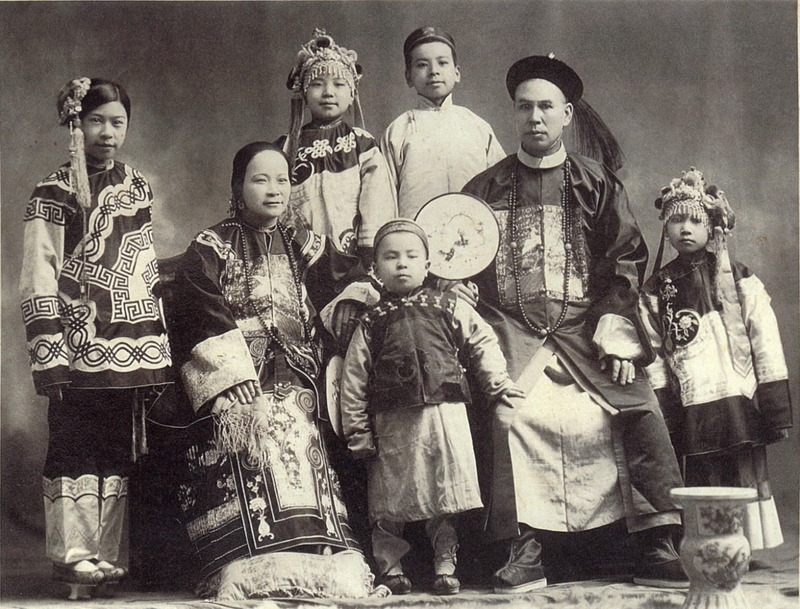 Chinese immigrants in Oregon. Birthright citizenship dates to 1898, when the Supreme Court cited the 14th Amendment in overturning a California law. Photo published by The Oregonian, courtesy of the Byrom-Daufel family. My Facebook feed is filling up with posts from liberal friends informing me that Donald Trump is, among many other bad things, an ignoramus when it comes to the Constitution. Trump allegedly stepped in it on Tuesday, telling Bill O’Reilly of Fox News that the 14th Amendment wouldn’t necessarily impede his rather horrifying proposal to deny citizenship to the children of undocumented immigrants born in the United States. Of course, it’s fun to think Trump is such a buffoon that he doesn’t realize something that’s part of the Constitution can’t be unconstitutional. All he’d need to do is spend a few minutes watching “Schoolhouse Rock!” videos on YouTube to disabuse himself of that notion. Birthright citizenship is not exactly a new issue. Jenna Johnson of The Washington Post noted earlier this week that, back in the early 1990s, none other than future Senate Democratic leader Harry Reid supported reinterpreting the 14th Amendment in order to end automatic citizenship — thus confirming a remark made on the campaign trail by Scott Walker, one of several Republican presidential candidates who have joined Trump in opposing it. In searching the archives, I couldn’t find a specific reference to Reid. But The New York Times reported in December 1995 that House Republicans and some Democrats supported an end to birthright citizenship, with most arguing that a constitutional amendment would be needed and others claiming that legislation would suffice. Any attempt to enforce such legislation would have triggered exactly the sort of court challenge that Trump envisions. And it’s not as though the 14th Amendment has stood immutable over time. After all, it wasn’t until 1954 that the Supreme Court ruled, in Brown v. Board of Education, that the amendment’s guarantee of “equal protection of the laws” forbade segregation in the public schools. Birthright citizenship was recognized by the Supreme Court in 1898, three decades after enactment of the 14th Amendment. In that case, according to the 1995 Times article, the court overturned a California law that had been used to deny citizenship to children born in the United States whose parents were Chinese immigrants. Trump’s rhetoric represents the worst kind of nativism, and he should be held to account for his words. But what he’s actually saying is bad enough. When the media exaggerate and distort, they hand him an undeserved victory. Also published at The Huffington Post. Ellen Clegg has been named editorial-page editor of The Boston Globe, less than a year after she was brought in to serve on an interim basis following the departure of Peter Canellos, now a top editor at Politico. When Ellen Clegg graciously accepted the challenge to take on the role of Editor, Editorial Page on an interim basis, she did so with enthusiasm, resolve, and a commitment to bring a fresh perspective and new voices to the section. I truly believe her leadership has brought vitality and relevance to the section, reflective of the improvements I’m seeing throughout the organization. From Day One, Ellen has acted as if the term “interim” was just a word, not her destiny. 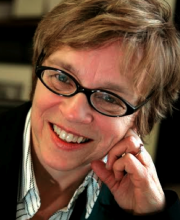 So it is my great pleasure to announce that as of Monday, Ellen Clegg is Editor, Editorial Page of The Boston Globe. No ifs, ands, buts, nor interims about it. Thanks, Ellen. Keep up the great work. Clegg has a closer relationship with Henry than Canellos did, having previously served as the top spokeswoman for the Globe — and, thus, for Henry. Before that she was a longtime Globe journalist, serving in a variety of editing positions. Among other things, she is the author of the award-winning book “ChemoBrain: How Cancer Therapies Can Affect Your Mind” (Prometheus Books, 2009). You can read more about her background here. Today’s editorial pages — simply labeled “Opinion” since the redesign — are characteristic of Clegg’s graphics-intensive vision. To my eye, the most interesting piece today is a short commentary by editorial writer Marcela García on a dangerous proposal to make it easier for Massachusetts families to opt out of mandatory vaccines. It’s accompanied by a large, data-heavy map. Online, you can find a chart showing the opt-out rate at every public school in the state. It should fuel follow-ups by community news organizations across Massachusetts. I’ve heard laments from several Globe readers — older, but smart and engaged — who think the redesign represents a dumbing-down of the paper’s traditional editorial and op-ed pages. For Clegg, it’s going to prove to be a balancing act in trying to attract new readers while not alienating her most dedicated audience. One thing that would help: doing a better job of alerting print readers that there’s additional content online. As editorial-page editor, Clegg is a masthead equal with editor Brian McGrory. Both report directly to Henry. It’s taken a couple of years, but it looks Henry’s team is finally in place. Funny. Just yesterday I was discussing with my students why journalists don’t give money to politicians. Of course, George Stephanopoulos only plays one on TV. Stephanopoulos never disclosed this information to viewers, even when interviewing author Peter Schweizer last month about his book “Clinton Cash,” which alleges that donations to the Foundation may have influenced some of Hillary Clinton’s actions as Secretary of State. Will he be able to brazen it out? Probably. The fact that he was donating to a politically wired charity rather than to a political campaign will help. But still.